The 14th Global Conference of the International Association for the Study of the Commons (IASC) took place from 3 – 7 June, 2013 in Kita Fuji, Japan. 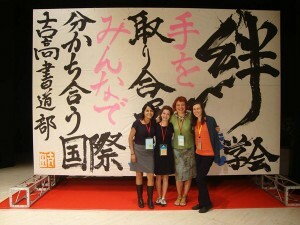 My personal journey to the event started when reading a post on the GESA Alumni Facebook page—“Is anyone in GESA 2011 interested in attending the IASC Commons 2013 Japan conference?” As I am living in Japan, it stirred my interest. Discovering my MSc thesis fit well with the conference topic of Commoners and the Changing Commons: Livelihoods, Environmental Security, and Shared Knowledge, I sent in an abstract. A few months later, I was accepted to present my research findings—my very first conference presentation as an MSc graduate. GESA alumni at Commons 2013: Maria Espinosa Romero (Mexico, 2012), Victoria Ramenzoni (Argentina, 2012), Aysen Eren (Turkey, 2011) and Karly Burch (USA, 2011). I earned an MSc in Agroecology through a double diploma program with the Norwegian University of Life Sciences (UMB) and The Engineering School of Agriculture, Alimentation, Rural Development and Environment (ISARA-Lyon) in October, 2012. As I was living in Japan at the time of my fieldwork studies, I became very aware of the ongoing Fukushima Daiichi Nuclear Power Plant disasters and decided to focus my research on the perceptions and behaviours held by residents of Kansai, Japan concerning the possible contamination of the food system with anthropogenic radionuclides. Participation in the 2013 Commons Conference allowed me to examine my thesis topic through a commons perspective, an exercise which I found to be very insightful and has contributed to the formation of my proposed PhD topic. Back on the GESA Alumni Facebook page I was excited to hear that three other GESA participants would be attending the conference, two of whom were awarded the prestigious Professor Elinor Ostrom International Fellowship on Practice and Policy on Commons . The conference itself was a great experience, though I must admit one of the most exciting parts was seeing GESA colleagues. This experience helped me to realise that GESA is not only an amazing three weeks spent in Europe meeting new colleagues and friends, discussing important issues and enjoying ethnobotany breaks. It really has shown up in my life as a support network—a space where I can pick up advice, become inspired, and find support in my academic and activist endeavours. Since the end of my MSc fieldwork, I have been in contact with various citizens groups in Japan concerned about the impacts of anthropogenic radionuclides on the food system. Deeply motivated by this topic, I am currently applying for a PhD position with the goal of contributing to a better understanding such a complex and pressing issue. So, I would like to say a big ARIGATOU to the GESA Alumni Facebook group for leading me to the 2013 Commons Conference last June. Coming from someone who knows its value, please keep posting! You never know who you may be inspiring.